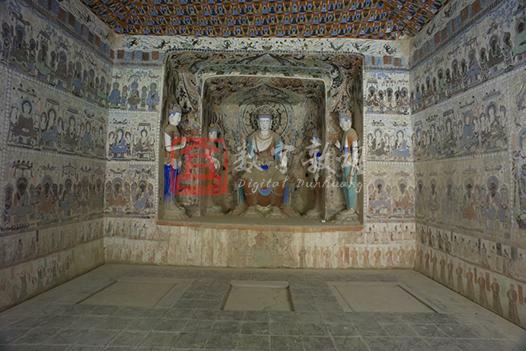 Located on the upper level of the Southern Area at Mogao, this cave was constructed in the Late Sui dynasty and renovated in the Five Dynasties and Qing dynasty. Its main chamber is a hall cave with a truncated pyramidal ceiling. The ceiling center features a pattern of lotuses and twisted vines, around it are draperies with triangular and pearled borders. The four slopes are covered with the thousand Buddha motifs. There is a double-recessed niche in the west wall, containing a seven-figure group: a central Buddha seated with legs pendent, two disciples (already lost) and four bodhisattvas (renovated in the Qing dynasty). On the top of the niche are 12 flying apsaras in different positions. On the wall behind the Buddha statue is a nimbus of flames and incarnated boys flanked by nine bodhisattvas on either side. Below them are images of Vasistha and Mrgasirsa. The outer niche has a lintel decorated with flames and lotuses, which is divided into the upper and lower level by pearled borders. The upper one contains a Mani Pearl with flames, and the lower one has a seated bodhisattva. On both sides are lotuses with twisted stems. On the The top of the ceiling are six apsaras, while on the two side parts are dragon-headed niche beam and lotus-decorated niche pillars. The south and north sides out of the niche are divided into three levels, one above another respectively for heavenly palaces, seven seated Buddhas, and male, female donors and attendants from top down. On the top of the four walls are apsaras leaning against the railings of heavenly palaces. The south wall is divided into three levels from top down respectively ; Upper with ten musician apsaras and fifteen seated Buddhas, a central preaching scene of Avalokitesvara flanked by 18 dhyana Buddhas, and lower with 26 female donors in high-waist skirts of the Sui dynasty and nine donor figures of the Five Dynasties. The north wall is also divided into three levels: Upper with ten apsaras leaning against the railings of heavenly palaces and fifteen seated Buddhas on the upper, a central preacing scene in which the Buddha wears a crown with a manifested Buddha image, and eight dhyana Buddhas on either side, and lower with 47 donors of the Sui dynasty and 28 male donors of the Five Dynasties. The top part of the east wall contains 17 preaching scenes each wtih one Buddha flanked by two bodhisattvas. Above the entrance is a picture of seven Buddhas, painted in the Sui dynasty. On each side of the entrance are eight dhyana Buddhas above the entrance are oxen, horse-drawn chariots and several Five Dynasty male donors. There are 116 preaching scenes altogether in this cave, in each the central seated Buddha holds different mudras and has different bodhi trees and canopies. This cave has the largest number of preaching scenes at Mogao. On the top of the corridor is a picture of Ksitigabha and the Ten Kings painted in the Five Dynasties. There is an inscription with the words "Monk Daoming." The north and south sides are used for the illustrations of Manjusri and Samantabhadra, each containing female donors below (most of which are obscured). The murals in the front chamber all date back to the Five Dynasties. On the two sides of the entrance in the west wall are scenes of Vaishravana attending a preaching scene. On the upper part to the south of the entrance depicts an image of Amogha-pasa, on the middle, an illustration of Panikarasuttau, and on the north side, an illustration of the Amitabha sutra, most of which is preserved. On the north and south walls are traces of the disciples, bodhisattvas, and donors, most of them are obscured. There are images of six apsaras and railings of heavenly palaces and seventeen dhyana Buddhas dating back to the Sui dynasty. Along the upper entrance is a picture of seven Buddhas. On the south side are eight dhyana Buddhas dating back to the Sui dynasty. Below them are ox-drawn chariots, groom, attendants of the Sui dynasty and two male donor figures of the Five Dyansties. On the north side of the entrance are eight dhyana Buddhas, below them are horses, grooms, guardians of the Sui dynasty and three male donors of the Five Dynasties. The south wall is divided into three level: on the upper level are images of 10 apsara musicians, railings of heavenly palaces, and 15 seated Buddhas. On the middle level are a central preaching scene of Avalokitesvara who wears a crown with a manifested Buddha image, holds a willow branch and sits with legs pendent. On its two sides are eighteen dhyana Buddhas (one of them was destroyed when a hole was dug through the wall). On the lowest level are twenty-six female donors in high waist skirts with thirty-one attendants. The musicians on the top of the south wall hold different music instruments like pipa, drums, flutes, or hold offerings. The female donors wear narrow-sleeved shirts and long skirts, looking slim. The scarves naturally hang down from their shoulders or elbows. They hold flowers in a graceful posture and subdued colors. At the end of the row of female donors are a group of female musicians, eight altogether, playing pipa, konghou, fangxiang, flute panpipe and marching slowly. Below them are nine donors and eight attendants of the Five Dynasties. A double-recessed niche in the west wall contains a central Buddha seated with legs pendent flanked by two disciples (already lost) and four bodhisattvas (renovated in the Qing dynasty). On both sides of the nimbus behind the statue are images of nine bodhisattvas, below them are images of Vasistha and Mrgasirsa. On each side of the nimbus on the top of the inner niche are six flying apsaras in different postures. The top of outer niche is decorated with a flaming niche lintel and six apsaras. In the center of the niche lintel is a Buddha seated on a lotus throne, and the twisted stems extending to two sides with leaves alternating in blue, earth red, redish brown, brown and black caused by discoloration. The outsides of the inner niche entrance contains dragon-headed niche beams and pillars decorated with lotuses as well as incarnated boys. Four bodhisattvas are painted on each of the two sides of the outer niche entrance. The edge of the outer niche is decorated with pearled strips. The north and south walls out of the niche are divided into three levels from top down, respectively occupied by the railings of heavenly palaces, seven seated Buddhas, and male, female donors and attendants. Below the niche are Buddhist utensils flanked by a bodhisattva and several donors. The north wall is divided into three levels: on the upper level are heavenly palaces with railings, ten apsaras, and 15 dhyana Buddhas; on the middle are a preaching scene of Maitreya siting with legs pendent. Behind Maitreya Buddha are images of two dragon-flower trees with a canapy above flanked by apsaras and two attendant bodhisattvas. On both sides of the preaching scene are eighteen dhyana Buddhas sitting on Sumeru thrones with hands in different mudras, all of them are flanked by two bodhisattvas. These dhyana Buddhas are rendered simply in blue, green, grey, black and earth red. Below them are fouty-seven male donors with thirty-nine attendants painted in the Sui dynasty. And there are twenty-eight male donors of the Five Dynasties who wear loose-sleeved robes and hold plates in hands. The inscription besides reads: "offerings given by the superior officer in the governor's office in Youzhou Prefecture." On the north slope are draperies of triangles and pearled patterns, pearled circles and edging at the bottom, below them are the thousand Buddha motifs, and on the lower part are flying apsaras. The ceiling center design is mainly composed of the flowers and draperies. In the square center, around the lotuses with widely open petals are small lotuses, which are surrounded by complicated and dense decoration motifs in elegant and magnificent colors. Around the square are thousand Buddha motifs, and below them are flying apsaras. There is a Samantabhadra illustration with four female donors below, all painted in the Five Dynasties. Most are obscured. There is a Manjusri illustration with five female donors below, all painted in the Five Dynasties and most are obscured. There is an inscription in the painting of Ksitigabha and the Ten Kings on the ceiling of the corridor, which contains the words "Monk Daoming." There are traces of some disciples and donors painted in the Five Dynasties, most of them are obscured. All the paintings date back to the Five Dynasties. There is an inscription on the space above the entrance. On the two sides of the west entrance are scenes of Vaishravana attending a preaching scene. On the upper part to the south of the entrance depicts an image of Amogha-pasa, on the middle, an illustration of Panikarasuttau, and on the north side, an illustration of the Amitabha sutra. There is a row of donors (obscured) below each of the sutra illustrations. There are traces of the Heads of Ananda and bodhisattvas painted in the Five Dynasties.